If your local Dairy Queen is closed from September through May, you may live in Michigan. If you’ve worn shorts and a jacket at the same time, you may live in Michigan. If you’ve had a lengthy telephone conversation with someone who dialed a wrong number, you may live in Michigan. If “vacation” means going anywhere North of Grand Rapids for the weekend, you may live in Michigan. If you measure distance in hours, you may live in Michigan. If you know several people who have hit a deer more than once, you may live in Michigan. If you have switched from ‘heat’ to ‘A/C’ in the same day and back again, you may live in Michigan. If you can drive 75 mph through 2 feet of snow during a raging blizzard without flinching, you may live in Michigan. If you install security lights on your house and garage, but leave both doors unlocked, you may live in Michigan. If you carry jumpers in your car and your wife knows how to use them, you may live in Michigan. If you design your kid’s Halloween costume to fit over a snowsuit, you may live in Michigan. If the speed limit on the highway is 70 mph -you’re going 80 and everybody is passing you, you may live in Michigan. If driving is better in the winter because the potholes are filled with snow, you may live in Michigan. If you know all 4 seasons: almost winter, winter, still winter and road construction, you may live in Michigan. If you have more miles on your snow blower than your car, you may live in Michigan. If you find 10 degrees “a little chilly”, you may live in Michigan. 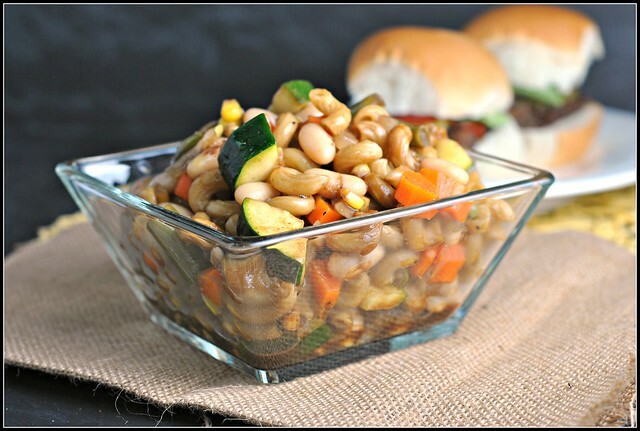 If you make this pasta salad and think, “It’s about darn time!”…you may live in Michigan. Okay, this last “if” is mine, but I mean it. Summer is finally here. Dare I knock on wood? I think not. I peeled out of work early on Friday to head straight to the beach. Life is good. Life is better, however, with this pasta salad in my life. 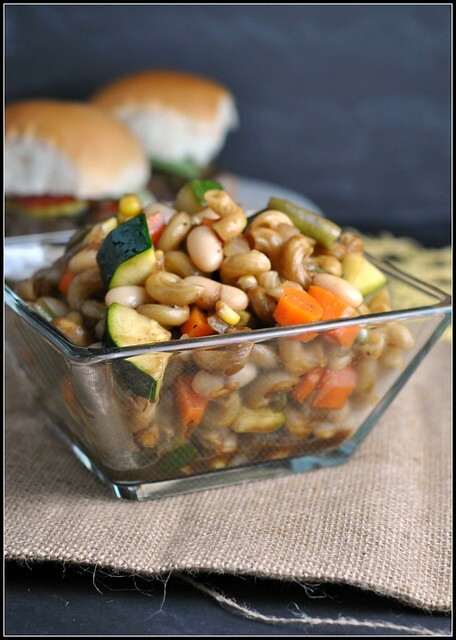 I have lots of entertaining coming up and I am truly thankful to have come across this incredibly simple, healthy, and delicious Summery Minestrone Pasta Salad. 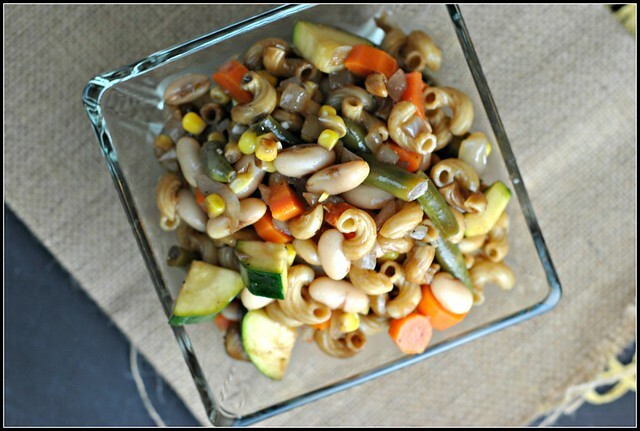 Pasta salad meets Italian summer in this easy dish! Bring 2 quarter of water to a rolling boil in a large pot; add pasta and cook until al dente, about 10-12 minutes. Drain in a colander, rinse with cold water and set aside. 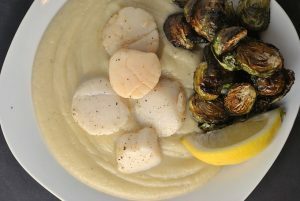 In a skillet, heat 2 tablespoons of the olive oil over medium heat until hot; add onions and saute until translucent, about 3-4 minutes. Add carrots and saute another 5 minutes or until softened. Add zucchini, green beans, and corn and saute an extra 3-4 minutes, stirring occasionally, until tender. Remove vegetables from heat and add to pasta, mixing thoroughly. Add vinegar, remaining 2 tablespoons olive oil, salt, and pepper to taste, stirring to combine. This sounds sooooooooooooo perfect for a hot Summer day! So funny about measuring distance in hours. I do that and people look at me and say “OK, but how many miles is it?” I always think, who cares…its the time that matters!!!! I wear shorts and a jacket all of the time, and I live in California! I’m a wimp when it comes to the cold, and summer evenings can get a bit chilly for me. 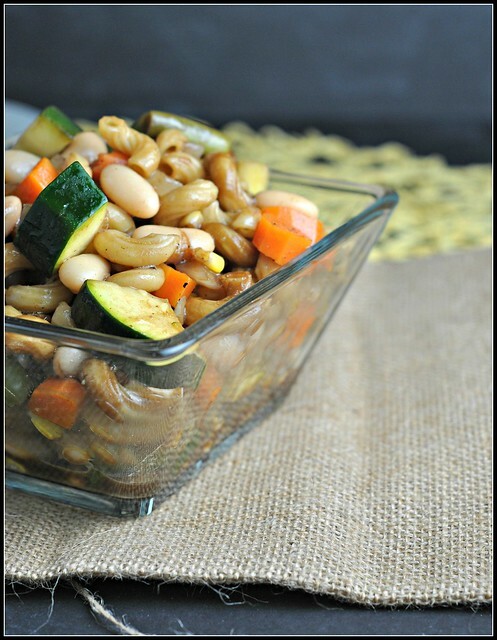 😉 Love the look of your pasta salad, especially with all of the canellini beans! Seize the summer moment! 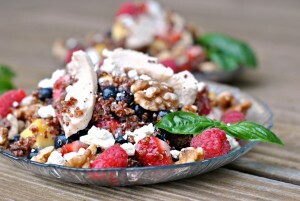 This is perfect July recipe for PA too! Looks terrific. I’ll make it this weekend.